Now that's going to take more than a can of bug spray to get rid of. The Niazesk are a species of tiny insects created long ago by the Brotherhood of Makuta to keep larger Rahi beasts in check, using their toxic bite. Makuta Mutran brought some samples of the insects to Karda Nui, where the strange waters mutated the Niazesk to great size and increased the potency of their poison. Now they haunt the swamps of the core, one more danger in a land full of them. The Niazesk is a combiner - like Devastator, but quite a bit more complicated than just shoving one robot's limbs into the butts of the other four and sticking on some extra armour. 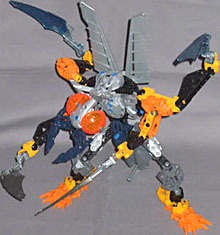 Instead of buying a Niazesk, you build it out of parts of other Bionicle sets, which makes it either free or bloody expensive, depending on your point of view. Instructions for building a Niazesk using parts from Vamprah, Pohatu, and Toa Ignika and its skyboard were released exclusively in Lego's Brickmaster magazine, so of course they're all over the internet by now. When the bio said the Niazesk's size was increased, it wasn't joking. In a fairly neutral stance the big bug stands almost 10" tall to the tops of its wings, and is 14" across from claw to claw without stretching; its maximum reach is 20". 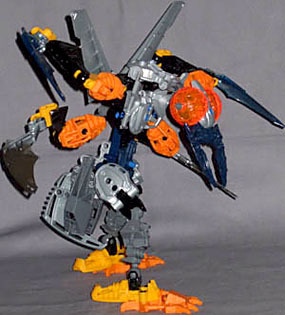 Taking advantage of the variety of pieces on offer from its component sets, the Nia is quite distinct from the regular Mistika and Phantoka, the typical Bionicle figures currently: its legs are similar in design, but on top of them you get a complex multi-layered torso with six limb joints, heavy forward armour, a craning neck, and a sizeable insectoid abdomen hanging off its back, with a wasp-like sting. The head is the stand-out feature, with clever use of Vamprah's claws and leech sphere halves as mandibles and multi-faceted eyes respectively - it's a radically different approach than the masked heads of the regular figures, and it's striking how lifelike the construct looks. 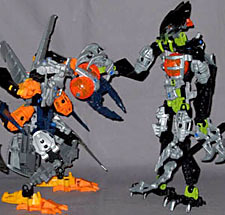 The combination of Ignika's yellow parts with Pohatu's orange ones shouldn't be overlooked either, as they give the arms and foot-claws a plausibly biological look, and their similar hues make it easy to see them as single multi-hued pieces, rather than two separate bits stuck together. Articulation is plentiful, as you'd expect. The back-mounted wings swivel, and everything else is balljoints - neck (beneath the head), all four shoulders, elbows and wrists, plus hips, knees and ankles. Peculiarities of this design include the backward-hinging elbows - they can move either way, but backwards looks far more natural; the hand-mounted scythe blades are plenty long enough to protrude anyway - and the static neck: with no joint at the base of the neck, the practicality of the head balljoint is limited. Also, this is a big, bulky figure, so there's only so far the legs can be spaced before the weight is too much to keep the feet from sliding outwards. Most figures larger than the standard size would have the same problem (unless they sport reinforced hips, as some do), but it's particularly noticeable on the Nia since its expansive upper body makes a wide leg stance an obvious posing choice. If you factor in the costs of the component sets, the Niazesk isn't cheap - Toa Ignika has his skyboard, making him more expensive than a standard figure, and much of it isn't used in the Niazesk build. But regardless of that, I have to say I'm impressed with this bug. 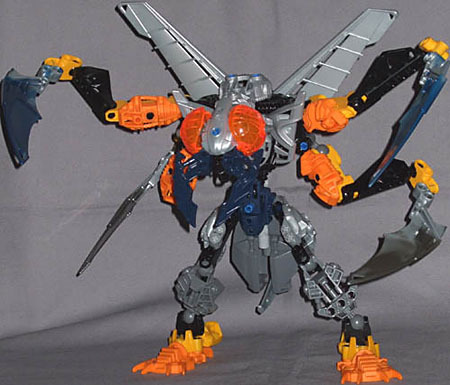 It's big, versatile, lifelike, and very different in its construction to the usual Bionicle warriors. I wouldn't say it's a good idea to buy the component sets specifically to build the Niazesk out of them, but if you've got the necessary sets anyway, it's fun and instructive to build this thing out of them, even if you then take it apart again.